I want to encode an audio message inside a regular music file; this shall be decoded by an audio analyzer running on another machine (by listening to the audio playback from the first machine). Change the pitch of secret audio message to D#/EB-10 (which is 19.5 KHz according to this site: http://www.flutopedia.com/pitch_to_frequency.htm). This should convert the secret audio message to something that falls outside of the human audible range. Merge this secret audio message with music file. Apply high pass filter at 19 KHz. I'm using Audacity to do the above steps. 1. The "secret" message is still audible in the encoded output. 2. Decoded output is significantly different than the secret message. I'm new to the audio dsp domain, so I'd appreciate a review of my approach and suggestions to achieve the goal that I described above. 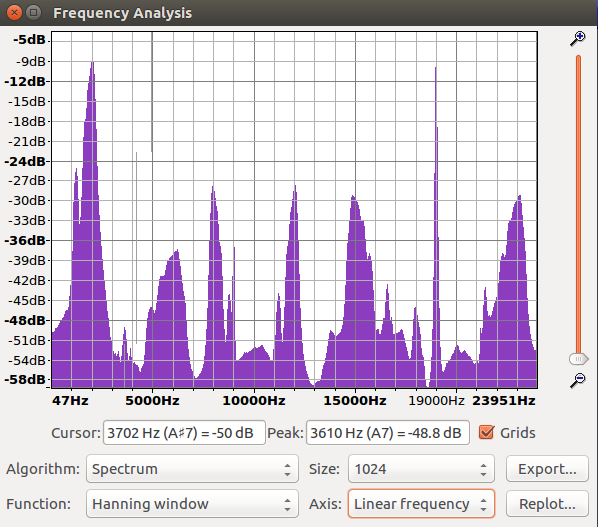 Below is the spectrum plot for "secret" audio message generated using Audacity. 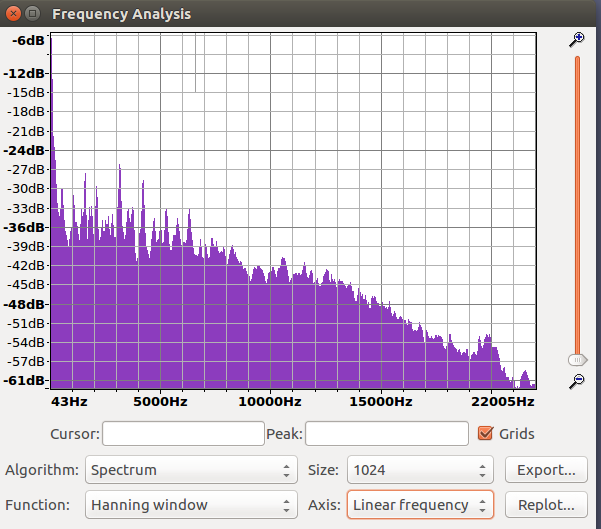 Below image shows linear spectral chart for "secret" signal mixed with generated tone of 19kHz. 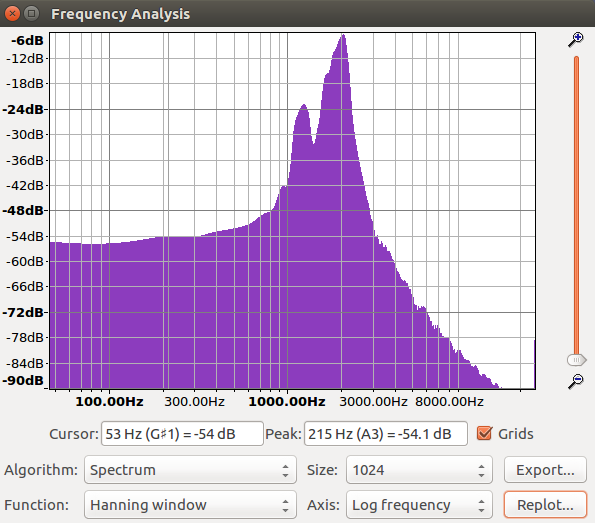 The below spectral graph is for the carrier "music" file. So, your unmixed secret signal has energy content in a frequency range of ca -6 kHz to +6 kHz. As far as I understand, you mix that with a real cosine of ca 19 kHz, so that it now has signal content in -25 kHz to -13 kHz, and +13 kHz to +25 kHz. All things are still nice and symmetric – so if you mix it back down to 0 Hz, you'd still have the original spectrum. Only that your 48 kHz sampling rate doesn't even allow your to unambigously represent a signal above 24 kHz – it instantly aliases into the lower end, and vice versa, so you have distortion in your signal of interest (still shouldn't be hearable). But then you high-pass filter at 500 kHz above the frequency you shifted to – but that cuts off 5.5 kHz of your signal! So, afterwards, your signal is no longer symmetrical in spectrum, and mixing it back down will produce non-constructive aliases. So, to understand what's happening here, plot your secret signal's spectrum after being shifted up. Don't use the logarithmic frequency axis, but simply linear frequency. Not the answer you're looking for? Browse other questions tagged modulation demodulation fsk or ask your own question.